During the struggle for independence, the British born general, William Miller hoisted the first flag that represented the whole of the emerging nation of Peru. A blue banner, with a golden sun placed on the centre of the flag. Upon Peruvian independence, General Jose de San Martin who designed the first flag of the Republic. This flag was quartered diagonally, with the upper and lower fields in white, and the other quarters in red. The flag is defaced with the national coat of arms. Consisting of an oval crown of laurel branches, surround a shield in which a sun was rising over the mountains, above the sea.However, due to its complex construction, it proved hard to make. 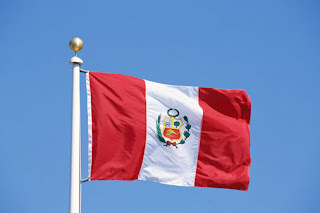 In March 1822, Jose Bernardo de Tagle issued a decree altering the flag of Peru. Inspired by the flag of Argentina, he changed the flag to a horizontal tricolour of red, white, and red. In the centre of the flag, a red faced golden sun. However, this flag proved difficult to distinguish from that of Spain at a distance, especially on the battlefield, so towards the end of 1822, the flag was altered to a vertical tricolour, with the sun representing Inti placed in the centre. In 1825, the flag was altered yet again.However, the change was only minor, with the sun being replaced with the national coat of arms. 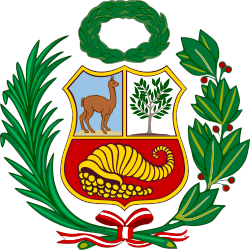 The coat of arms feature a Vivunca, a Cinchona tree, and a the horn of cornucopia with coins spilling out of it. Surround the shield are 2 branches of palm, and laurel, and an oak crown above it. In 1836, Peru was dissolved into North, and South Peru. North Peru kept the old flag and images, and South Peru had to create a new flag. They came up with a horizontal bicolour of green and white, with a red bar running up the hoist of the flag. 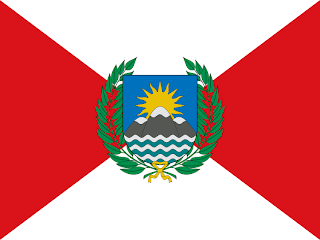 On the stripe, a golden sun topped with 4 stars representing the 4 departments of the new South Peru. 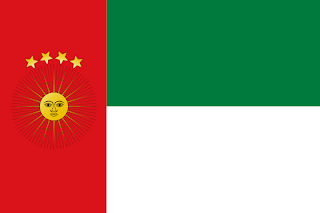 Both South and North Peru where absorbed into a new Peru-Bolivian Confederation, which brought in a new flag. 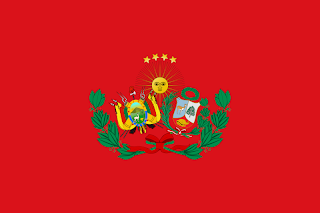 A Red banner, with the coat of arms of Bolivia and Peru, with the sun of South Peru looking down upon them. 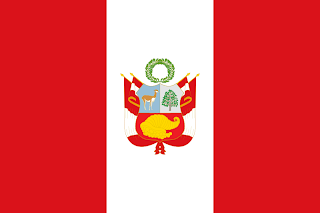 With the dissolution of the Confederation in 1839, the Republic of Peru was reformed, and it returned to using the old coat of arms, and flag. In 1950, in order to simplify manufacture, General Odria eliminated the coat of arms from the centre of the Civil flag, leaving it as a plain tricolour of red, white, and red. This had already been used as the de facto civil flag before this time. The State flag, however, carried on using the national coat of arms, and the war flag adopted an altered form of the coat of arms. The central shield is the same, topped with the oak crown. However, the wreath surrounding it has been removed, and replaced with crossed spears behind the shield with Peruvian tricolours attached. The colours are supposed to represent blood (red), and peace (white).